Caryn Cziriak, founder of Spirit Foli, has been a musician most of her life. She has found joy in singing from a very young age, had classical vocal training, and has been performing as a singer for over 30 years. She has served as Artistic Director of Patagun!, Inchantations, and Infinite Blessing music ensembles. A hand drumming enthusiast since the late 90's, Caryn has studied with various teachers, including Glen Velez, Menes Yahudah of Tam Tam Mandingue, Mangue Sylla, M'Bembe Bangoura, and master drummers Mamady Keita, and Famoudou Konate. In her African drumming classes, Caryn teaches traditional West African rhythms for djembe and dununs in a way that makes even beginning drummers feel at ease. 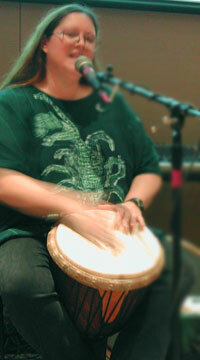 She also regularly facilitates a community drum circle at Pebble Hill Church in Doylestown, PA, which is a great introduction for people who are new to drumming and would like to try it. Caryn has studied chant from various cultures, and has facilitated Meditation workshops using sound and chant and since 1998. She composes original chants and songs in styles which range from classical Latin mass to rhythmic kirtan, to a combination of jazz and gospel.